The Memorial Hall, which is a very substantial structure and neat in design costing £2500, was formally opened on Wednesday afternoon. The building strikingly reflects the progress of Minyip and does great credit to the architect and the contractors. The celebrations during the afternoon an evening were carried out with great enthusiasm and the attendance on each occasion was very large. An outstanding feature was the presentation of a memorial flag and cheque for £25 from the Minyip Red Cross Society. The presence of the Minyip Brass Band after a lengthy "recess " -with Mr. A. Lutze in command was gratifying to all concerned, and the musical portion of the celebrations, including the ball, at which the Minyip orchestra excelled, was favorably commented upon. 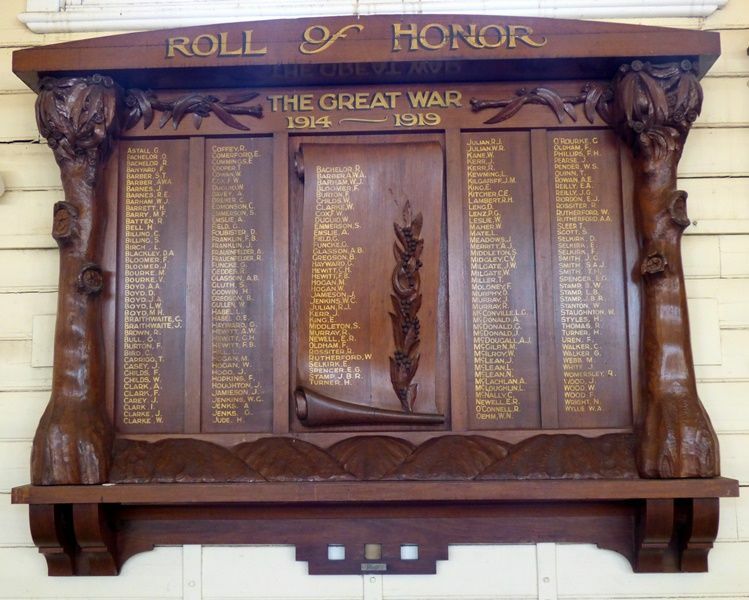 On one side of the honor roll was a laurel wreath from the Red Cross members, and on the other a large bunch of rosemary (for remembrance), arranged by Mrs. Finlayson on behalf of the returned soldiers, the streamers on this representing all the color patches of the A.I.F. Attached to the bunch was a card with the words, "For those who fell in remembrance." The Horsham Times (VIC), 2 June 1922.